Ferrari 488 GTB Review 2019 | What Car? The 488 GTB is Ferrari’s mid-engine heartbeat: more expensive than the soft-topped, soft-bellied California, and a little cheaper than the V12-powered GT4C Lusso or F12. Broadly speaking, the 488 has the same twin-turbocharged V8 engine as the California, but with slightly larger in size and with a good deal more power. Its 661bhp mean it's in the supercar premier league, counting only the likes of the McLaren 650S and Lamborghini Huracán as direct rivals. The 488 GTB is eye-wateringly expensive, and the asking price is only a starting point. If you want a few options, the price you’ll actually pay will almost certainly start with a ‘2’, and it’s still easy to spend a lot more than that. However, this is one of the finest-driving cars that money can buy, so if money truly is no object, the 488 GTB is a hugely tempting proposition. 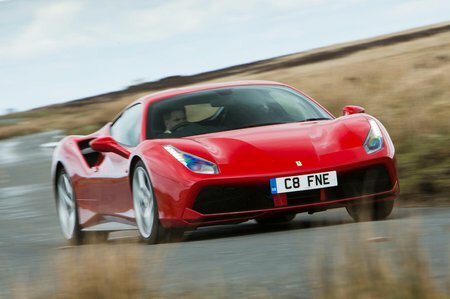 Read on over the next few pages for our detailed impressions of the Ferrari 488 GTB and how it compares to other cars of its ilk.